Please note that all of the cover photos up there are not mine. They are free photos from WordPress. Beautiful, aren’t they? I am a wife to a loving husband, a mother to a bright son, a daughter to perseverant parents, a sister to loyal siblings, and a certain someone who prays goodness to you. This blog used to go by the name of MessyConscience. I ended up in a long hiatus starting 2013. Since then, my external and internal affairs have unfolded in ways I could not ever imagine. It is 22 September 2018 today, my anniversary with my beloved husband. Malay is my mother tongue. It is my home, but I find it limiting when it goes deeper. Maybe it is only me. Nevertheless, reading something beautifully written in Malay gives me all the feels even though not many words are written. Maybe it is a language that does not require much efforts to deliver. I love it. Most of my old writings were written in Malay. English is my second language. I find it more comfortable to write in English when I am indulging into more complicated subjects. I also found my missing vocabs in English, instead of Malay. Since I have been married to my husband, my English has become a lot better. I will be writing in English more frequently in this new ‘era’ of mine. If you are curious enough to need a translation in both languages, just email me. As soon as I felt like I really walk firmly through my daily life, I thought of writing again. Five years were a long time. As I read through my old blogs, I realized that my old self needed help. And over the years and up until this moment, I truly feel that the Almighty has been giving me all the help I yearn for. And He does not stop guiding. Nevertheless, the urge to write is always there. A little more for you, my followers, to enjoy while I am still at it. Last week I was online-researching for public places for children in the area that we live in, as the residence park which we frequented to is small and ill-maintained. To my delight I finally discovered a public park within minutes of driving. We have since been going there almost everyday as a morning routine. My toddler and I have been enjoying the vastness of the place, the genuineness of its woods and the size of its playground. The air, the sounds of birds, and the unrushness and undemanding manner of nature have been keeping us there from morning till noon, almost everyday. 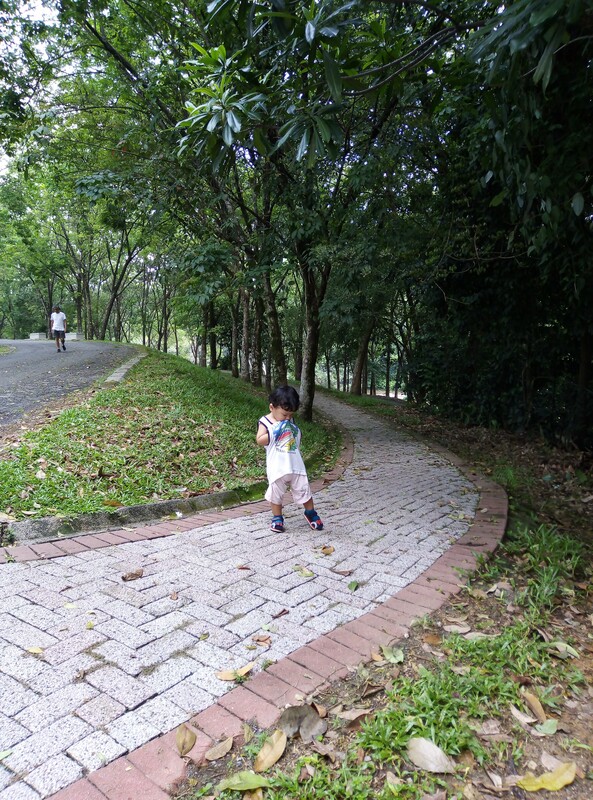 As I watched my toddler walking freely through the park, climbing and sliding and running, I was reminded of how most parents struggle to find a suitable daycare or school for their autistic children. The way I read their desperate posts in the online group that I participate, it looked like most autistic children do not fit in any schools, even those who claim to be ‘autism-friendly’. In the park, I felt like nature is the best learning environment for us autists. No demand, no rush, no expectations. Yet so much to be learned out there. I detested schools that I went to, no matter how prestigious my parents thought they were. They all gave me some sort of abuse and neglect. Like my child, I believe that I was born with anxiety in the gene, and going to school made that even worse. Although things have becoming easier since I have identified myself as autistic, the effects are still truly felt. Make no mistake, I understand it was no one’s fault. Life is a learning process for all, including the adults who helped me grow, but that does not mean that I have to follow their footsteps. Now when I look at my toddler, I see how confident and care-free he is most of the time, especially when he is minding his business at the park and at home. I do not want to jeopardize that calmness by sending him to school. School was like the wilderness for me. Scary and lonely. I realized that I was on a different level than most of my peers. Understanding the lessons was not the issue at all, because even though I might not comprehend what the teachers said during classes, I usually managed to understand at home when I studied alone. Learning was not the main problem for me. Instead, it was about keeping up with the social dynamics at school and the acceptance that I did not receive from being a different kid. Ostracism was continuous throughout years of schooling. It was a wild time. I felt lost in the sea of people. At worst times, these things even demotivated me to study and even to function everyday. I suspect that most schools which claim to be ‘autism-friendly’, but end up to fail their autistic kids, are motivated only by money. I would not let any of these selfish adults make a victim or a neglect of my toddler. My first option is always homeschooling, and nature-schooling, or whatever you want to call it. Until my son implies that he is ready to expand his social circle, I would aid him in navigating throughout his younger time. The decision to marry and to have a family did not come easy for me. I am too blessed to have a son. I do not want for him to end up having crippling social anxiety and negativity towards people as a result of bullying and teasing. I want to coach him with possitivity, to help him understand how life is unpredictable but manageable, and to help him manage his anxiety and emotions. I believe no one could do it better than his own parents.